Seville, Jerez de la Frontera, Ronda, Antequera, Granada, Alhambra, Cordoba, and more! Southern Spain has long been a destination so attractive that it's been invaded time and again by various cultures for nearly 3,000 years. 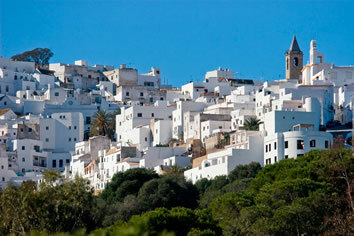 Andalucía — the large region in southernmost Spain — has held an allure and a whiff of the exotic for a long, long time. Nowhere does Europe come closer to Africa — physically and metaphorically. Much of its natural beauty, history, culture, and architecture span two continents, and it's this unique blending that has long given the region its distinctive flavor. In particular, it's the legacy of the Moors, whose 700-year presence in Spain remains etched in stone across the land, which has greatly created Andalucía's exoticism. This itinerary will encompass two of Spain's grandest palaces — the stunning Alhambra in Granada and the Alcázar of Seville; the magnificent cathedral of Seville; the country town of old Moorish Ronda with its winding streets perfect for wandering and split in two by a fantastic gorge; the passions of flamenco music and dancing in the old quarter of Seville; the purebred Andalucián horses at the Andalucían School of Equestrian Art in Jerez de la Frontera, a city world-renowned for its sherry production; and the stunning Mezquita in beautiful Córdoba — originally an ancient mosque now overlaid with a Renaissance-era cathedral. Another major draw is that Andalucía is popularly seen as the quintessential Spain. This is the home of nearly everything that is perceived of as stereotypically Spanish: bullfighting; flamenco; fragrant orange blossom, tapas, sherry, bullfighting... Come along with us and experience soulful Southern Spain! Afterwards we will head out for our first of several memorable meals on this trip! 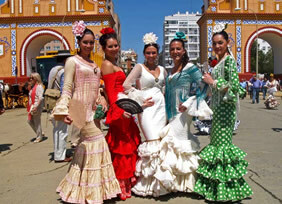 With a population of more than 700,000, Seville is easily Andalucía’s largest city and the fourth biggest in Spain. It’s also one of the most romanticized places in the country: exotic, steamy, scented with orange and jasmine, jacarandas, flamenco, Gypsy culture, tapas, great architecture, vivacious festivals, twisting cobbled streets... In short, it’s to Seville that travelers go to indulge their fantasies about Spain. Please Note: Our program includes two nights (one full day) in Seville. If you’d like to arrive a day before our tour begins we can set you up with an extra night at our hotel. We visit Seville's cathedral — and its sheer size may take your breath away. It's not just the height of the Giralda (the cathedral's most emblematic structure) that's striking but just the mass of the building. Begun in 1434 the cathedral was to be "a church which those who see it finished will think we were mad for attempting." Today it's considered the largest church in the world — bigger in volume than St. Peter's in Rome. The 12th century bronze doors have inscriptions from the Koran. Indeed, it was on this site that Christians worshiped in a 12th century mosque. At its highest point the central nave rises to almost 140 feet, supported by 12-foot-thick columns. The retablo (altarpiece) is the largest in the world at almost 120 feet. The centerpiece of the cathedral is the main altar in the Capilla Mayor, an extraordinary work begun in 1482 and completed a century later. It contains more than a thousand sculptures in wood and gold. 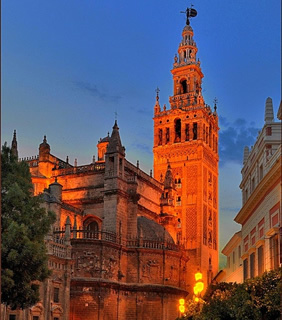 At one corner of the cathedral is the entrance to the Giralda, the symbol of Seville and a landmark from almost anywhere in the city. We'll also visit the Alcázar. Pedro I ("the Cruel") built this magnificent 14th-century mudéjar fortress-palace south of the cathedral. It's the oldest royal residence in Europe still in use: On visits to Seville, King Juan Carlos and Queen Sofía stay here. From the Dolls' Court to the Maidens' Court through the domed Ambassadors' Room, it contains some of the finest work of Sevillian artisans. 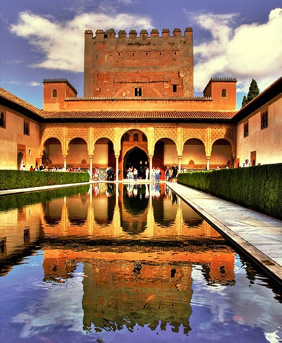 The Alcázar contains the finest examples of 14th-century Moorish architecture outside the Alhambra. Ferdinand and Isabella, who at one time lived in the Alcázar and influenced its architectural evolution, welcomed Columbus here on his return from America. The afternoon is free in Seville to follow your own interests. Wander the maze of streets that is the Barrio de Santa Cruz, the city's most evocative quarter. Or check out the Casa de Pilatos, so called, by one theory, because it is meant to be a reproduction of Pontius Pilate's house in Jerusalem. It is one of Seville's prettiest mansions. Or engage in some serious people-watching at a café. A superb flamenco show will round out the day, and then you’re free for this evening’s dinner. Seville has no shortage of excellent choices! We head south today to Jerez de la Frontera, the economy of which is almost entirely dependent on the production and export of sherry and brandy. The Moors called the city "Sherrish," and they ruled until 1264. Around this time "de la Frontera" was added to the name as it was on the front line of constant skirmishes between the Moors and Christians. Aside from sherry, Jerez is also known for horses. The Royal Riding School is based here, and the town hosted the World Equestrian Games in 2002. We'll visit the stables of the Royal Riding School, the training and breeding center of thoroughbred Andalucían horses whose lineage can be traced back to the 15th century. These are the horses of choice for Europe's royalty since the 16th century. We also have an obligatory stop at a superb sherry bodega in the city, which just happens to house a superb private art collection, and this will be followed by lunch. We head into a rugged interior zone where the so-called Pueblos Blancos lie — sublime “white villages” that are scattered like patches of snow among spectacular steep mountain slopes. This is a lovely drive, passing some of the great scenic landscapes of Spain. The Spanish fir, which only grows in four locations above 3,300 ft., thrives here. Some of the limestone slopes rise as high as 5,000 ft. Castle ruins and old church bell towers also form part of the landscape. Short of crossing the Mediterranean, this area will give you the best taste of a Moroccan landscape. Arriving in Ronda we check in for the next two nights at our historic hotel with views right out over the Tajo Gorge. A lovely spot! 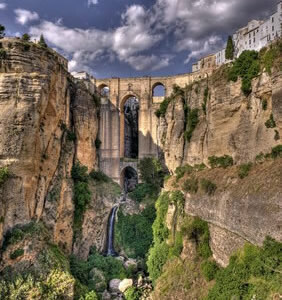 The diminutive city of Ronda enjoys an incomparable setting, perched high above the Tajo Gorge. On both sides are houses clinging to cliffs that look like they might plunge down the 300-foot abyss with the slightest push. Ronda also has beautiful and historic art and architecture with one of the oldest bullrings in the country and plenty of Roman and Moorish ruins. Ronda has enthralled the likes of Victor Hugo, Rainer Maria Rilke, Ernest Hemingway, and Orson Welles. Less romantically, during the Spanish Civil War both Nationalist and Republican prisoners were forced to jump to their deaths in the gorge (depending on which group was in control of Ronda at the time) - events that were to act as a basis for Hemingway's For Whom the Bell Tolls. We will wander the town taking in some of its more interesting sights, including the Plaza de Toros, one of the oldest, most beautiful rings in Spain. Built in 1785 it was here that local bullfighter Pedro Romero (1754-1839) established modern bullfighting techniques and style. We'll also have a visit to Ronda's loveliest enclosed space – the Palacio Mondragón, a 14th-century Moorish palace. This afternoon you're free to explore more of Ronda on your own, perhaps indulging any shopping urges you might have, taking a hike in the gorge, or just relaxing on the grounds of our beautiful gorge-side hotel. A leisurely morning in Ronda is followed by a drive east through some gorgeous Andalusian countryside to arrive at the lovely and historic town of Antequera – a fine place for a lunch stop at one of our favorite places. This town is one of the region’s historical and architectural showpieces. Nestled among steep, rugged mountain peaks Antequera has a perfectly preserved ancient center — and even Neolithic dolmens. We’ll then depart for Granada, just an hour’s drive, arriving there in the late afternoon. We settle in at our lovely accommodations, housed in a beautiful and historic convent. Historical note: Federico García Lorca, the most widely translated Spanish author of all time, was born in 1898 near Granada, and his family moved into the city when he was 11. Lorca, who was gay, came to be seen as a champion of Andalucían subculture through his plays and poetry. At the beginning of the horrific Spanish Civil War in 1936, Lorca went into hiding in Granada as he was viewed as a sympathizer of the Republican government (despite not being politically active). He was closely associated with the liberal left because he was gay, his plays were “inflammatory,” and his sister was married to Granada’s Socialist mayor. He was dragged out of hiding that summer and murdered three days later at the age of 38. As Lorca had predicted in one his poems, his body was never found. This evening we’ll have a wander up to Granada’s hilly Albaicín quarter, oozing with character and old-world charm, where we enjoy an excellent dinner. Today we visit the amazing Alhambra. Nowhere else in Spain can evoke past Islamic glories with such force. A Moor from medieval times might have considered the Alhambra as paradise on earth. And it is the most complete surviving example of its kind in the world. This remarkable palace is the most visited monument in Spain and ranks high in all of Europe. It truly is one of the most extraordinary collections of buildings and gardens on the continent. Although the complex started life in the 11th century, its most spectacular period of architecture came in the 14th century with the construction of the Palacio de los Leones (the private living quarters of the sultan and his family) and the Palacio de Comares (where emissaries and important guests were received). Many would say that the subsequent additions made by Christian rulers upset the aesthetic unity of the Alhambra, yet the Palacio de Carlos V and the Convento de San Francisco (a fine expression of Italian Renaissance) are certainly beautiful in their own right and add to the sense of history. Just outside the Alhambra walls is the Generalife, a wonderful pattern of walkways, fountains, and garden patios. 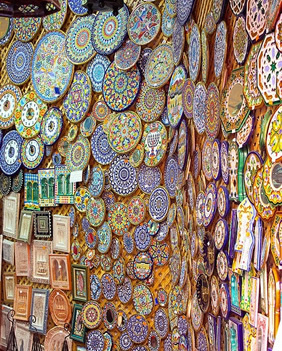 The name derives from the Arabic phrase for "Garden of the Architect." These were the pleasure gardens of the sultans. The gardens are a delightful place to rest after seeing the rest of the Alhambra, and there are stunning views over the complex and the Albaicín district of the city. Leaving the Alhambra we will go to the Capilla Real (Royal Chapel), built as a mausoleum for Queen Isabella and King Ferdinand in the 1500s. They wished to be buried in Granada, the scene of their most important victory. This late-Gothic chapel is Granada's finest Christian building. The royal coffins rest in the crypt sitting beneath elaborate Renaissance sepulchers. There is also a stunning altarpiece, and the sacristy here houses a priceless collection of crown jewels, including Isabella's crown and scepter and Ferdinand's sword, which were traditionally paraded through Granada during the annual celebration of the conquest of the Moors. Built on to the Capilla Real is the cathedral of Granada, which replaced the city's mosque as the final expression of the Catholic rehabilitation of the city. The architecture is one of the finest examples of Spanish Renaissance. The remainder of the day is free for you to explore more of Granada on your own with dinner open this evening. Our last leg of this wonderful exploration of Andalusia brings us to the gorgeous city of Córdoba where we immerse ourselves in the magnificent Mezquita, the most ambitious mosque ever built and a powerful symbol of the city’s pre-eminence in the glory days of “al-Andalus.” It was begun back in the 8th century, but in the 14th and 16th centuries Christian structures were added. From the Mezquita tiny whitewashed alleys wind their way through the Judería, the old Jewish quarter. Córdoba enjoys an abundance of restaurants – and many good ones. Lunch will be on your own followed by some free time to wander the charming back streets of this ancient city. This evening we’ll enjoy our farewell dinner in an excellent restaurant and recount the many wonderful sights and activities of the past week in Andalucía. After breakfast you can depart from Córdoba by train according to your own travel plans. The high-speed train runs through Córdoba connecting you to Madrid in a little under two hours. 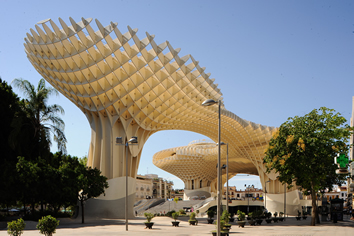 Alternatively, in about 50 minutes you can reach Seville, which has an airport with national and international flights. 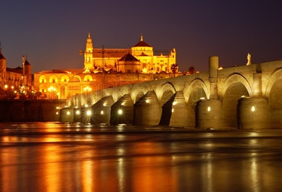 Please Note: If you’d like to spend more time in Córdoba, we can set up extra nights for you at our group hotel. • Personal expenses such as laundry, phone calls, room service, minibar charges, etc. Please note: We reserve the right to alter some of these accommodations if circumstances dictate. Any changes would be to a similar standard of hotel. Our selected 4-star hotel combines storybook charm with super convenience, making it the perfect setting for a visit to Seville. Located in the historic center, this sumptuously restore mid-19th century mansion offers terrace views of the Cathedral and beyond, from the old Jewish quarter of Barrio Santa Cruz, to the gardens of the Real Alcázar and the towers of La Plaza de España. Built in 1864, this three-story boutique hotel retains most of its original architectural elements. Massive studded-wood doors open to the hotel, leading to a central courtyard from which all rooms are distributed in traditional fashion. The property features all the modern amenities, including free Wi-Fi service throughout the premises, combining up-to-date technology with historic charm. Complimentary afternoon tea is another nice touch. This country-style hotel dates from 1906, when it was built by an English financier in honor of Queen Victoria. Back in the day it was much used by high-ranking British officers stationed in Gibraltar. The property was given a facelift last year and has terraces that hang right over the 500-ft. Tajo Gorge. Hemingway frequently visited, but the hotel is known best as the place where poet Rainer Maria Rilke lived and wrote The Spanish Trilogy. The extensive gardens and terraces have an enduring appeal, as does the Victorian architecture with towering chimneys and sloping roofs. There's an outdoor pool, a spa, and the restaurant enjoys stunning views. Wifi is available throughout. Decorated in a sleek contemporary style, the rooms are spacious and airy. The spa includes a hydrotherapy pool, a Turkish bath and hydromassage showers, and there's a range of health and beauty treatments available. Our selected hotel in Granada is one of the city's grandest and most unusual, is very well-located, and emanates from a meticulous renovation of a 15th-century convent and cloister and 12th-century Moorish houses, creating luxurious and stylish 5-star accommodations with an imaginative combination of modern and antique architecture. Indeed, the site has been declared a Spanish artistic and historic monument. The various structures are interlinked with a sophisticated ultramodern shell of glass, steel, aluminum, and polished stone. The hotel is decorated in a contem porary style with parquet flooring, fresh natural colors, and mosaic tiles. The spacious lobby has a comfortable lounge and a striking bar. Complimentary mini bars, spacious bathrooms, and free wifi in the common areas are some of the hotels' extra features. Our selected boutique hotel in the heart of the old medina has just 11 rooms with soothing color schemes that effortlessly blend history with contemporary design, each with its own unique charm. In this beautiful Moorish-style house set on a quiet cobbled street guests can enjoy a hammam with a salt bath; a cozy living room; and two roof terraces with 360- degree views where you can contemplate this historic city and its impressive Mezquita. The main “room” of the house is the central patio featuring an elliptical well from the days of Al-Andalus and a classical style fountain that, like other patios around Córdoba, is a UNESCO-recognized cultural asset. The service is attentive and cordial, and the breakfasts are delicious. Day 1: There’s frequent High-speed trains service from Madrid’s Atocha station to Seville, which takes about 2½ hours. You can also fly into Seville as there are flights from Madrid, Barcelona, Paris, London, Munich, Brussels, Lisbon, and Rome. This is just a general guide as routes are subject to change. There may be other flights operating by the time this trip runs. Day 8: The high-speed train runs through Córdoba connecting you to Madrid in a little under two hours. Alternatively, in about 50 minutes you can reach Seville, which has an airport with national and international flights as indicated just above. Our tour manager in Andalucía is by far one of our favorites over the 20 years of operating our trips. Originally from England, he made Andalucía his home 15 years ago. Since then, he has explored most nooks and crannies of Andalucía (and quite a lot of Spain, of course). His knowledge of the local culture, language, and history will take you not only on a tour but on a journey through time to appreciate precisely how Andalucía came to be. His charm, easy-going manner, and sense of humor are also winners! We have structured the days in this program in the most logically flowing way in order to keep driving times to a minimum and to avoid repetition of roads. However, some days will see more driving than others. None of the driving is done at long, uninterrupted intervals. We stop throughout the day for our visits, thus breaking up the day’s activities. Our transportation will be in a comfortable tour bus (although not the large 40 or 50-seater variety), and at no time will it feel like an endless road trip. Days 3, 5, and 7 are our transfer days and will involve the most driving, around 2-2½ hours of driving time, but again with stops along the way. The number of nights that we stay at each hotel is as follows: 2-2-2-1. We can set up additional nights for you in Seville (pre-tour) and Córdoba (post-tour) if you’d like. The towns and cities we visit cannot be driven through on a bus as the city centers are many hundreds of years old. We have to explore the towns (and other sights) on foot. This could pose a challenge to those who have any walking issues. Please check with us if you have any concerns in this area. In general you should be able to walk about 2-3 miles a day in total – though not all at once. In an effort to make it as simple and seamless for our guests as possible, on some trips, such as this one, we think it’s better to collect some tip funds from you at the beginning of the tour on Day 1 so that you don’t have to fuss with that every day as you go along. These tip funds will be distributed by the tour manager as the trip unfolds to the wait staff in restaurants, driver(s), and hotel porters. We prefer that you tip the tour manager directly at the end of the tour. A small group surcharge of $200 per person will be added to a group size less than 14 travelers. A small group surcharge of $400 per person will be added to a group size less than 12 travelers.